There’s no better way to celebrate the month of February than with your family and friends. Visit BurJuman as it celebrates love and new beginnings at the Mall’s Valentine’s Day and Chinese New Year festivities. From the 7th to the 14th of February, 4 pm to 10 pm daily at the main atrium, BurJuman recreates the romantic tradition of Paris’s Love Lock Bridge with its own twist. Create an indelible note to your love on the back of a lock, fasten it on the frame and take the key as a keepsake of your love! Snap a pic of you and your loved one at this special moment, and you could win with the Mall’s Snap, Share & Win competition. Chinese New Year is also celebrated on the 5th of February, which marks the start of the New Lunar Year. Visit BurJuman as it brings a little bit of China to Dubai with its vibrant red d�cor and Chinese lanterns. 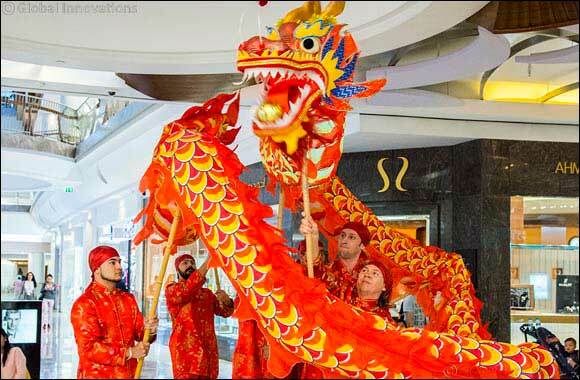 The mesmerising traditional Chinese Dragon Dance will also be showcased through a 15-minute roaming performance at 7 pm, 8 pm and 9 pm on the 1st, 2nd and 5th of February. It’s an entertainment for young and old alike to bring in good luck for the New Year. As we wait for the celebrations to begin in February, make the most of ‘Around the World’, open until the 6th of February 2019 at BurJuman.